This entry is part 11 of 13 in the series Magento 2 for PHP MVC Developers. Earlier posts include Introduction to Magento 2 -- No More MVC, Magento 2: Serving Frontend Files, Magento 2: Adding Frontend Files to your Module, Magento 2: Code Generation with Pestle, Magento 2: Adding Frontend Assets via Layout XML, Magento 2 and RequireJS, Magento 2 and the Less CSS Preprocessor, Magento 2: CRUD Models for Database Access, Magento 2: Understanding Object Repositories, and Magento 2: Understanding Access Control List Rules. Later posts include Magento 2: Advanced Routing, and Magento 2: Admin MVC/MVVM Endpoints. In the first article of this series, we described how to create a simple MVC/MVVM endpoint in Magento 2. Implicit, but unstated, was that we were setting up an endpoint for Magento’s frontend cart application. While the backend admin application uses the same MVC/MVVM/View system as the frontend, there’s additional features based on backend security and user interface conventions in Magento 2. Today we’re going to start exploring the Menu Item system. Our end goal is to add a link to Magento’s left side admin application which, as you’ll learn, is the first step towards adding a backend page to Magento 2. There’s a few things we’ll want to make note of with regards to the structure of an admin URL. First, admin URLs have a four segment structure. The first segment, admin, is the area. All URLs in the Magento admin start with this additional URL segment. The next three segments are the URL front name, controller name, and action name. Same as a standard frontend controller, Magento 2 combines all three of these segments to create a single controller class name. Magento 2 is a “One URL, One Controller” system. If you’re not sure what that means, don’t worry, future examples below will clear that up. This special code is required for all URLs, and is here to help prevent cross site script attacks. If you fail to include this key with your URL, Magento will reject the request as invalid. This URL key is why we need to create a Menu Item in the first place — without Magento generating a URL key for us, there’s no simple safe way to access a standard admin controller. We’re going to dive right in and create a new Menu Item. 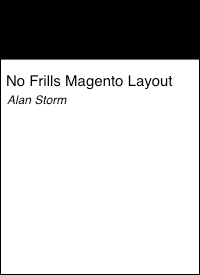 First, we’ll need to create a Magento module to hold our Menu Item. You can create the base module files using the pestle command line framework’s generate_module command. Next, we’ll want to add a menu.xml file to our module. Create the following file with the following contents. Congratulations! You’ve just created your first Menu Item. At its simplest, a menu.xml file is a collection of <add/> nodes. Each of these nodes adds a Menu Item to Magento’s backend. The id attribute defines a unique identifier for this node. By convention, (but not required) this should the the name of the module (Pulsestorm_MenuTutorial), followed by two colons (::), followed by lowercase text that describes what the module does (top_level_example). 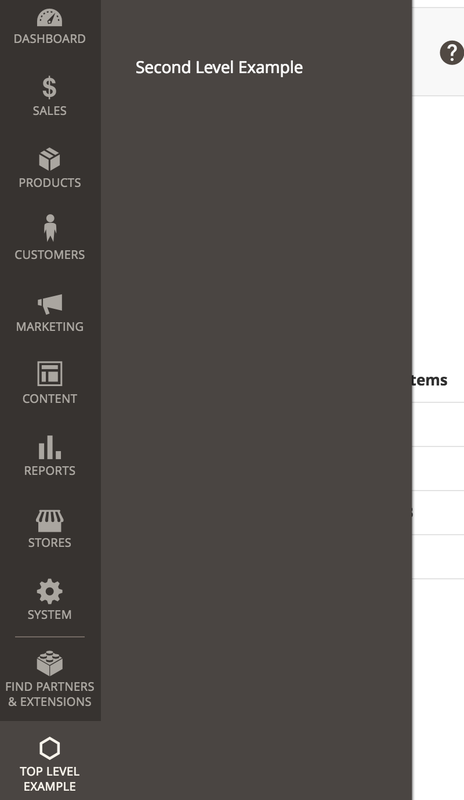 The title attribute (Top Level Example) controls the text an end users sees for the Menu Item. The module attribute should match the current module — this may seem redundant with the id attribute, but remember, it’s only convention that forces you to use the module name in a Menu Item’s id. The sortOrder attribute controls how this Menu Item is sorted with the other Menu Items in the system. The 9999 value ensures our module shows up under all the stock Menu Items. Finally, the resource attribute defines the ACL rule a user must have in order to access this Menu Item. Normally, you’d define your own ACL rule in the same module, and use it here. For simplicity’s sake, we’re using a predefined ACL rule (Magento_Backend::content) from a standard Magento module. If the logged in user does not have access to the configured ACL rule, the Menu Item will not render for them. For Magento 1 developers, its worth noting that the ACL rule requirements for a module have been somewhat simplified. All we need to do in Magento 2 is specify an id — there’s no confusing matching of ACL hierarchies with Menu Item hierarchies. The tradeoff, of course, is it’s no longer possible to infer a Menu Item’s ACL rule based on its hierarchy. Here we’ve add a new <add/> node to our menu.xml file. We’ve given this new Menu Item a new, unique id attribute and a new title. Normally, this Menu Item would have a different resource from its parent (giving systems owners fine grained control over which modules show up) but to keep things simple we’re using the same rule as our parent item (Magento_Backend::content). The important parts are our parent and action attributes. The parent attribute should be a Menu Item ID that already exists, and will tell Magento this new Menu Item (Pulsestorm_MenuTutorial::second_level_example) is a child of the parent. Magento 1 developers will want to take note — these add nodes all exist at the same XML tree level — the parent/child relationships between them are dictated by these parent attributes. The action attribute is the three segment, frontName/controllerName/actionName Magento 2 URL identifier. We’ve borrowed an action from the CMS module for this tutorial. Clear your cache, reload the page, and your Top Level Example Menu Item should now trigger a fly-out menu that contains your single Second Level Example link. If you click on this link, your browser will being you to the specified action. Notice that our second level Menu Item has become a hyperlink-less parent header, with the third level item as a link. Magento Menu Items are limited to three levels of hierarchy — you can’t go any deeper than this. In the above examples, we showed you how to create your own top level Menu items. Before you do this in your own modules, its a good idea to ask yourself if your module really needs a new top level item. Using the Menu Item system, its possible to add your Menu Items to existing Magento core menu categories, and doing so avoids jamming up the admin with too many top level modules. Your menu will appear under the top level System Menu Item instead. There’s no clear guidance on where to put your module’s Menu Items — this is something every module developer will need to decide on their own. We ran through creating a Menu Item manually as a teaching exercise. Fortunately, pestle has a generate_menu command that makes creating Menu Items simple. Here’s how add a new Menu Item to Magento’s own System -> Other Settings menu with pestle. First, lets use pestle to create a proper ACL rule for our Menu Item with the following. and then edit the generated acl.xml to give our rules some titles. If you’re not sure what the above does, checkout the Understanding Access Control List Rules article. Next, we’ll use the generate_menu command. Even if you’re familiar with pestle, you may want to read through our description of the interactive command line workflow below, as there’s a new pestle feature in play. Notice how the entire interactive workflow to select a Menu Item ID is represented by one argument (Pulsestorm_MenuTutorial::a_menu_item). If you click on this link, Magento will redirect you to the Dashboard page. This happens because we have no URL endpoint setup for this URL! A Menu Item only generates our link. We still need to setup a MVC/MVVM endpoint for our page, which is what we’ll be doing next time!